As a bonus, as with all my recipes, it’s super easy to make. Believe me, if it requires actual culinary skills, it ain’t happenin’ in my kitchen. 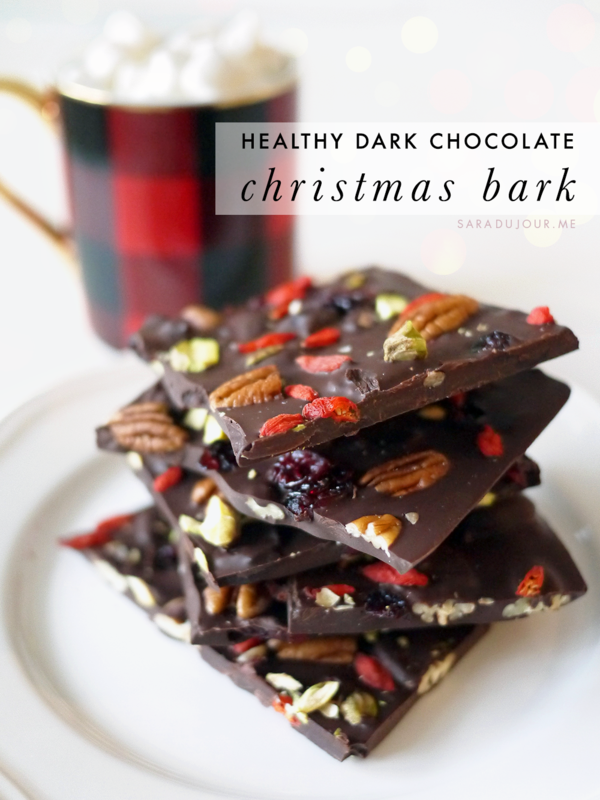 Why is it called “Christmas bark”? Because it’s decorated with red and green ingredients, of course! I see you eyeing me skeptically for calling this holiday recipe a healthy one, so let’s get into it for a moment. Goji berries are a superfood dating back thousands of years that have a variety of health benefits. They’re used in traditional Chinese medicine and are loaded with antioxidants. They even help fight high blood pressure and improve your skin. Pecans are also chalk-full of antioxidants, as well as vitamins A, B, E, folic acid, calcium, magnesium, potassium, zinc, and fiber. Pistachios are full of heart-healthy fats, protein, fiber, and they help improve digestion, too. Cranberries are a great source of vitamins C, E, and K, manganese, copper, and pantothenic acid. And as for the chocolate? Well, it’s 79% dark, so that’s pretty good – and very different from sugar-and-dairy-filled milk chocolate. Cocoa has been proven to be one of the best sources of antioxidants on the planet, and can improve overall health and reduce the risk of heart disease. 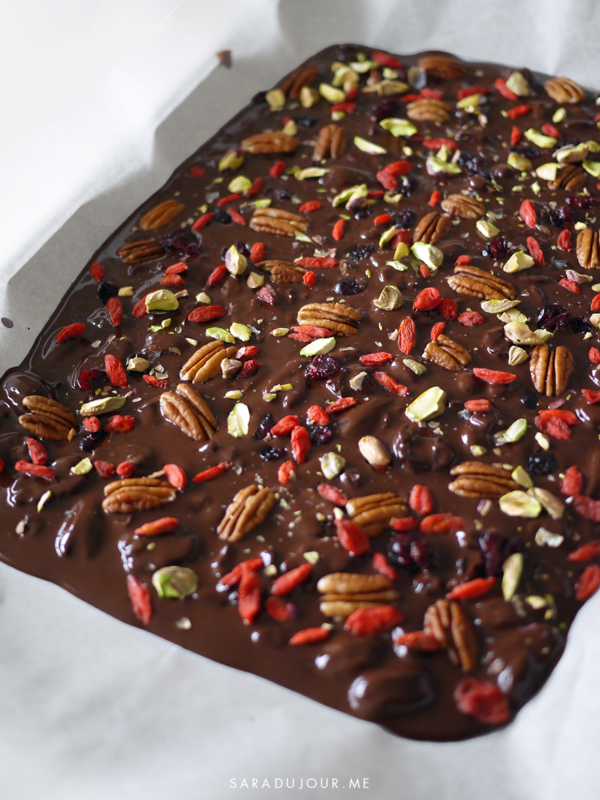 So feel good about enjoying a piece or two of this chocolate bark. 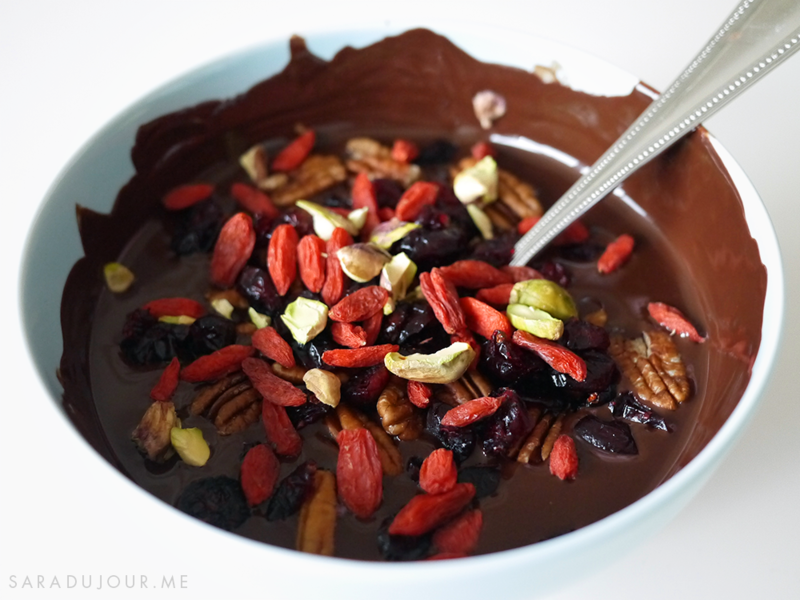 It’s a great way to feel festive and indulgent without doing too much damage to your body. Start by melting your chocolate. I used bar chocolate, but you can absolutely also use chocolate coating – it’s sold in big hunks at most bulk stores. 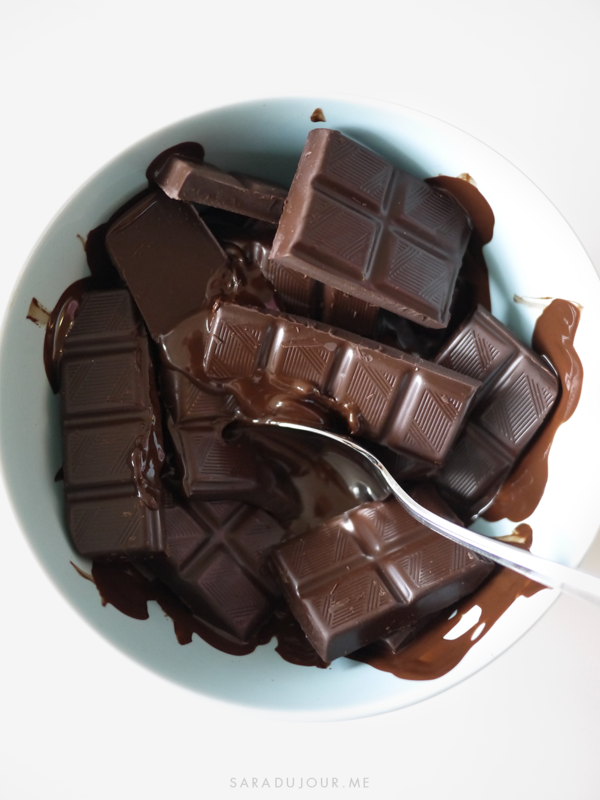 Whatever chocolate you use, break it into smaller pieces to help it melt quicker, and pop it in a bowl in the microwave. It’s really important not to overdo it, so heat it in little bursts, and check to see its progress. You can always pop it in to melt for a few more seconds, but you can’t go back. 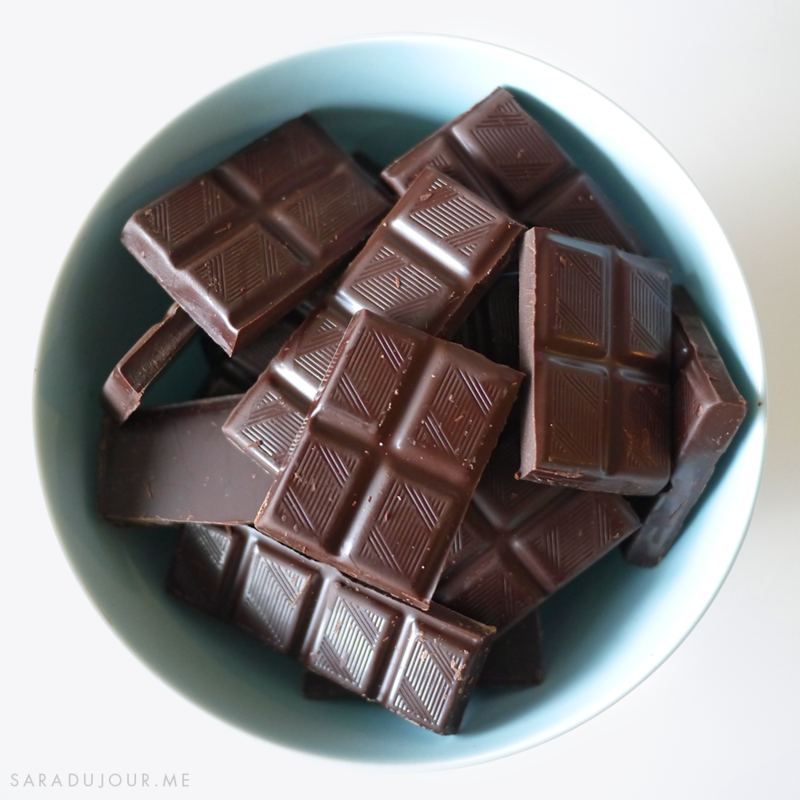 Every microwave and chocolate type is different, but in my experience, it’s been about 20 seconds twice or three times to get the perfect, heavenly melted consistency. After the first or second heating, you’ll see your chocolate start to get melty. If it’s soft enough, try stirring it a little – you may be able to get any remaining chunks to melt completely simply by doing this. If not, heat it up for another 10 or 20 seconds. Ah, here we go. Resist the urge to stop and eat this as soup. Be strong, you can get through this. While your chocolate is melting, get your pistachios ready. I prefer pistachios still in their shells, because I find they taste fresher. So, now’s the time to crack them open. After shelling them, instead of chopping them, lay a chef’s knife flat on its side on top and slam down with the side of your palm, getting them to split open beautifully for you. (They’re prettier this way.) If any resist this method, chop them. Of course, you can leave them whole if you want, but they won’t look as green that way. 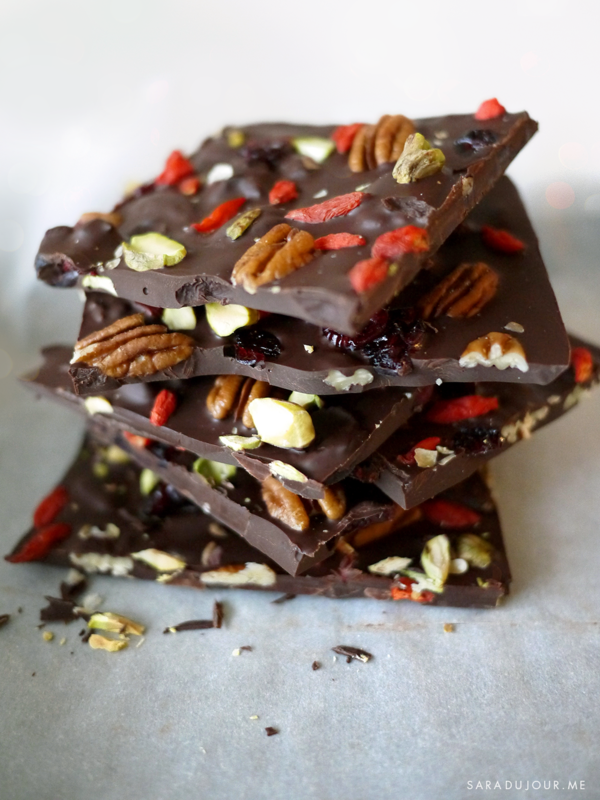 Some make chocolate bark by sprinkling the ingredients only on top of the chocolate, others don’t top it at all and only mix the ingredients inside the bark. I like to do both. 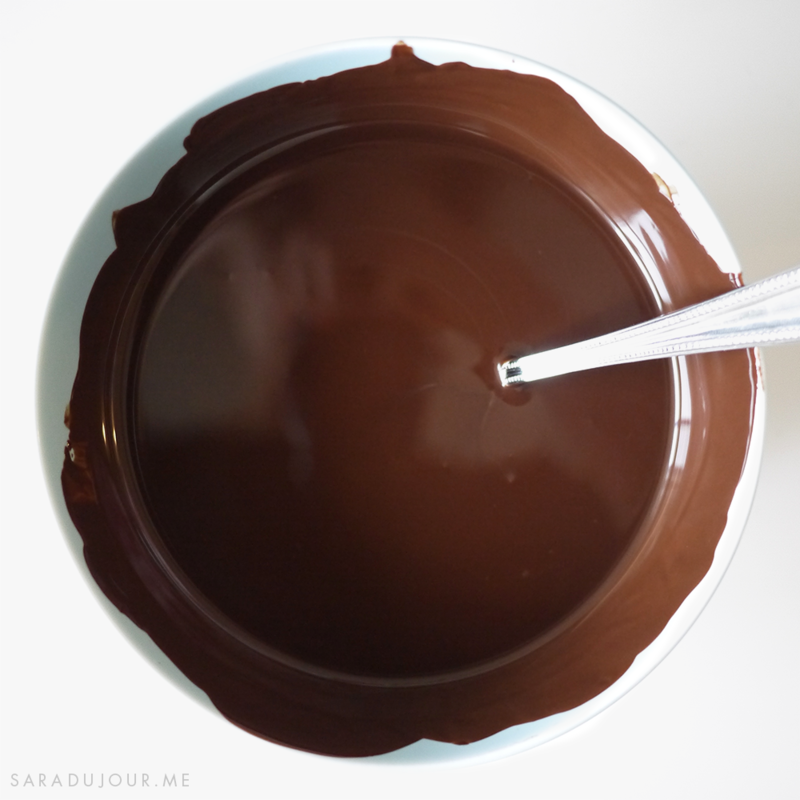 Add all four ingredients to your melted chocolate and stir that up completely. 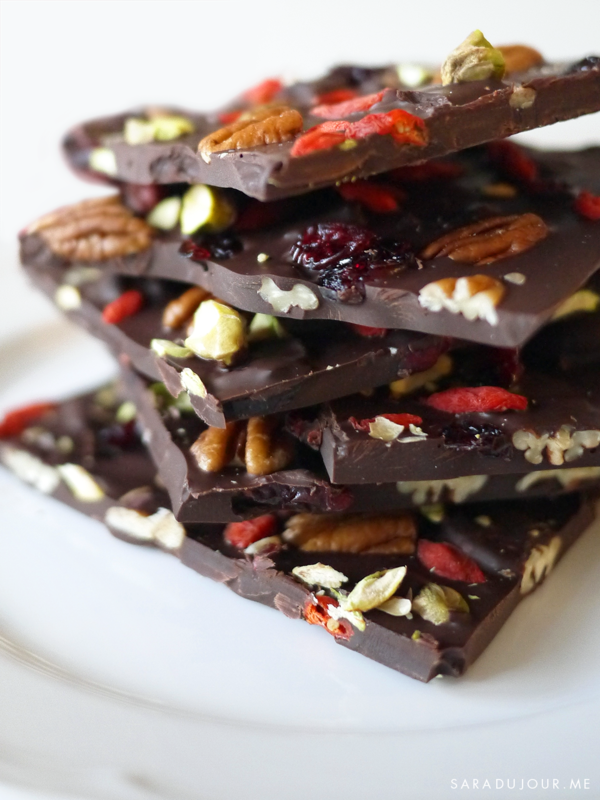 Make sure you’ve put some of each ingredient aside to top the bark with, too. 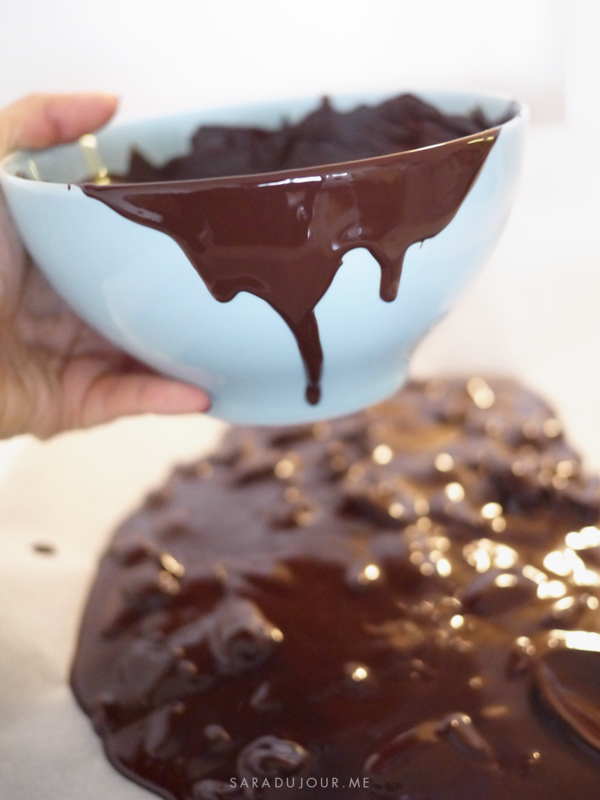 Pour that mixture onto a baking sheet lined with parchment paper. Ahh, couldn’t you just watch that forever? I think I just got chills. Using a spoon, nudge the mixture around on your baking sheet. Try to insure the ingredients are distributed as evenly as possible. 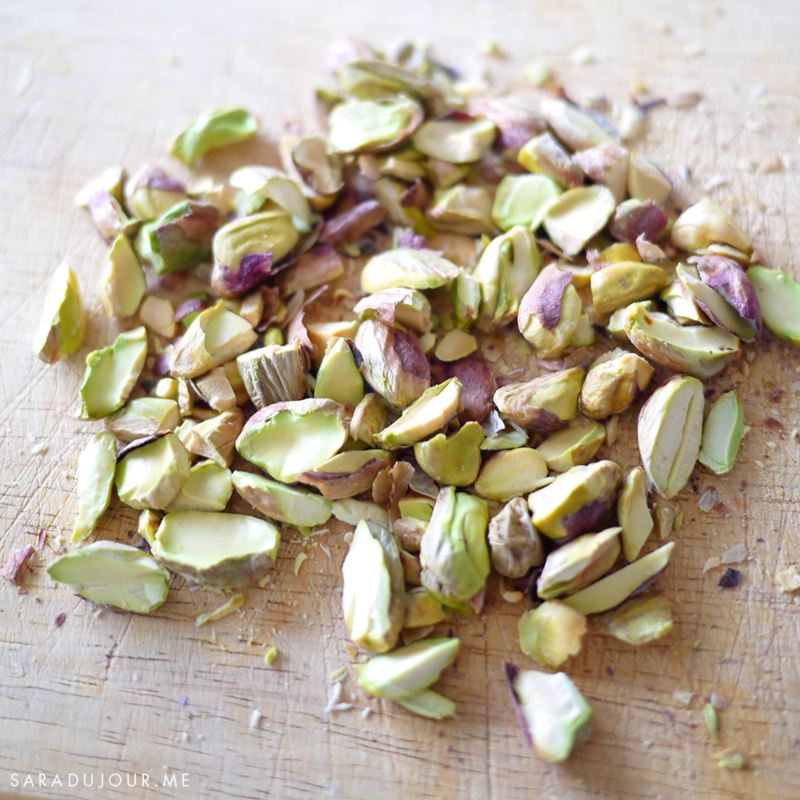 …and finish with your crushed pistachios. As a final touch, sprinkle a pinch of sea salt over everything (or Fleur de Sel, if you’re extra fancy). This will enhance the flavours of the dark chocolate and help combat some of the natural bitterness. Admire your handiwork and pop that beauty into the fridge. You’ve got spoons to lick. Cleaning was truly never this fun. 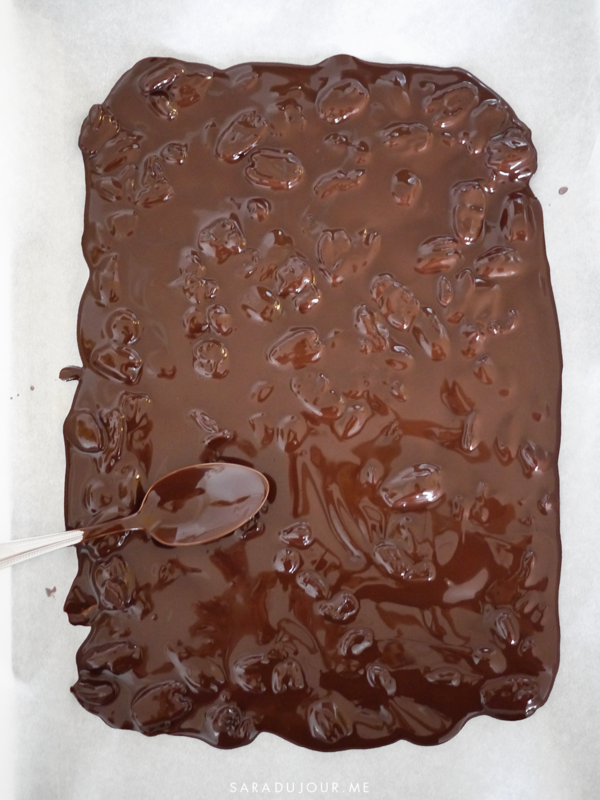 Once it has properly set in the fridge (anywhere from 30 minutes until about an hour, depending on the particular type of chocolate you’ve used and how thick you’ve made your bark), it’s time to break it into pieces. If you want more even, unified shapes, cut it into squares with a big chef’s knife. 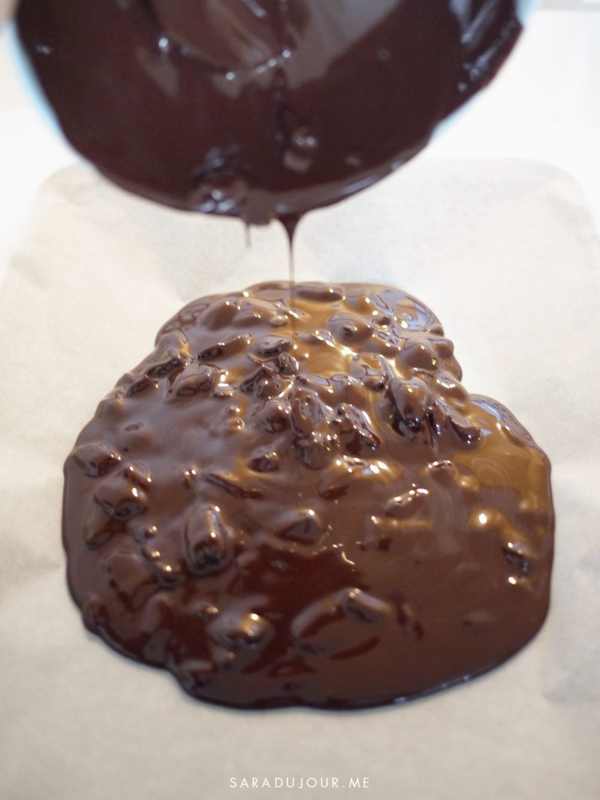 This method has the benefit of showing a nice cross-section of the ingredients you’ve mixed in with the chocolate. If you prefer more organic shapes, break it into pieces by hand. Know that with this method, it’ll likely break between ingredients – meaning in places where there’s just chocolate, so you won’t get that cross-section. There’s no good or bad way, it’s just a matter of aesthetic preference. I cut mine with a knife vertically (as seen above) and then proceeded to break the four pieces into smaller chunks by hand. That’s it! Step back and revel in the marvellous final product. Go ahead, take a photo for instagram. Snap your friends. Show off. You deserve it. 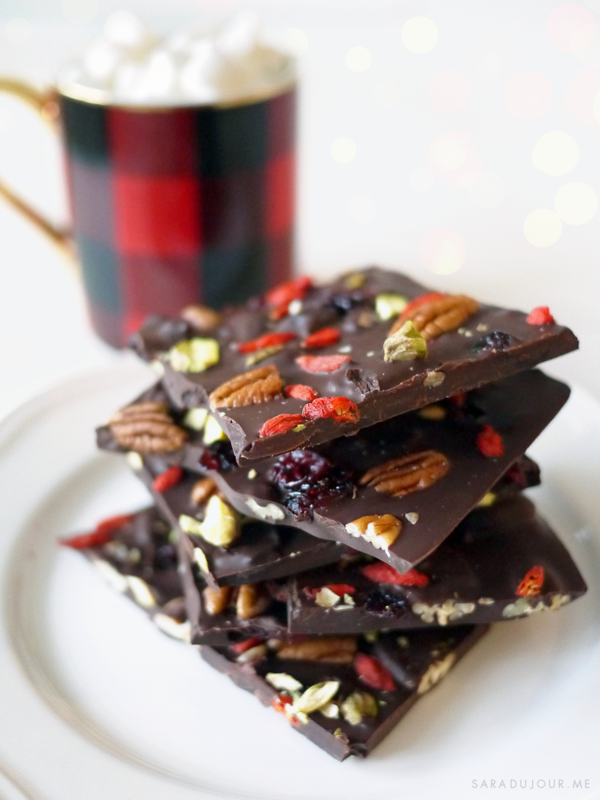 Chocolate bark makes a wonderful holiday gift, too. It seems fancy, thoughtful, and impressive – no one has to know you whipped up a batch in the Saint Nick-of time. Wrap a stack of bark pieces in cellophane decorated with a Christmas ribbon, or pop a few pieces in a tin with parchment paper. 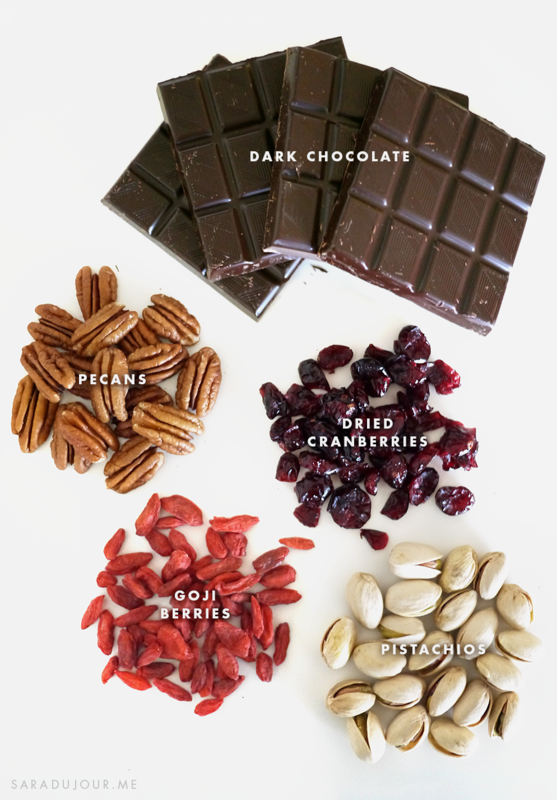 It’s the perfect gift idea for a coworker, friend, or family member, and you can always customize the type of chocolate you use and what you mix it with to suit their tastes. 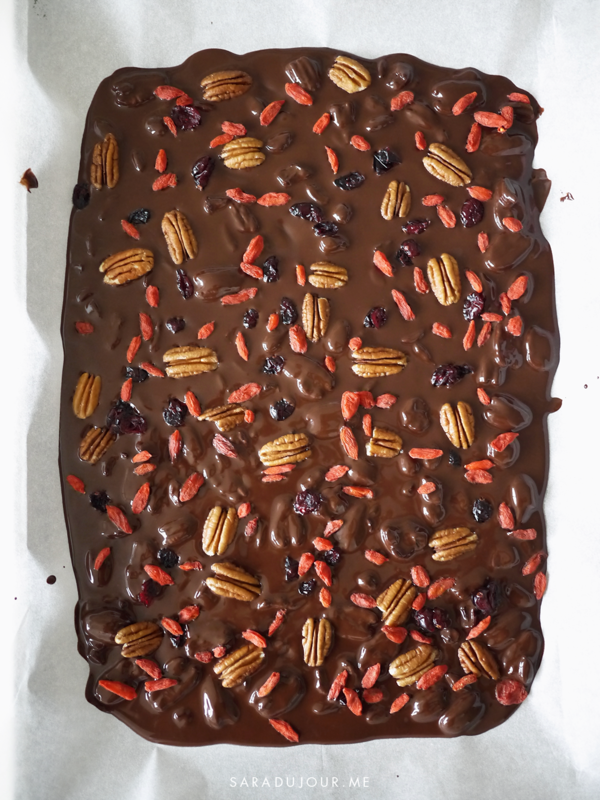 There’s really no end to what you can put in chocolate bark, from pretzel pieces, candy canes, caramel, nuts, sponge toffee, more chocolate, marshmallows, or dried fruit. This recipe looks amazing! 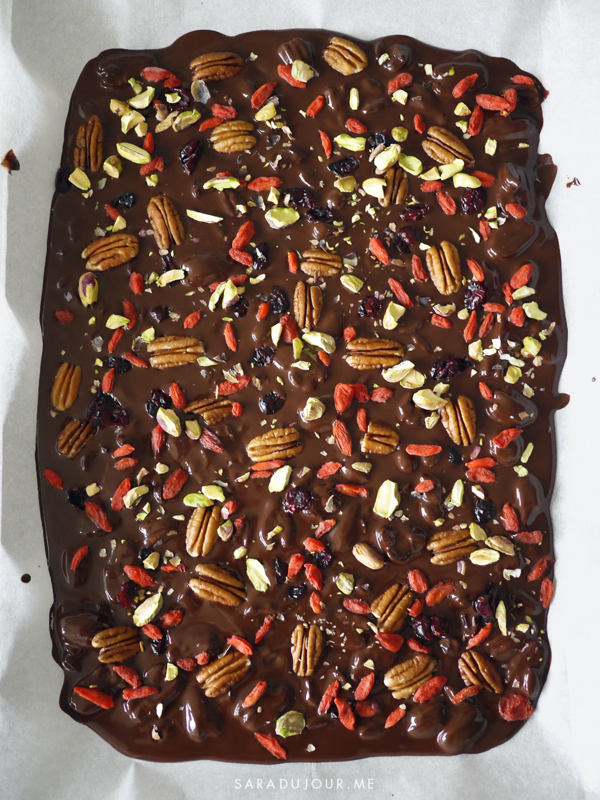 My mom loves chocolate bark so I’ll have to make it for her! This looks absolutely amazing! I’ll definitely have to try it out!